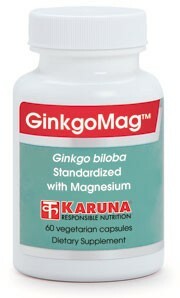 GinkgoMag combines two natural substances with effects on peripheral circulation. Ginkgo biloba extract (GBE) inhibits platelet activating factor (PAF), which reduces blood viscosity and relaxes the smooth muscle tissues of the blood vessels, respiratory tract and other organs. Magnesium affects vascular and bronchial tone through its participation in the regulation of neuromuscular electrical potentials and neurotransmission. Together, GBE and magnesium promote normal respiratory air flow and optimal cardiovascular and peripheral vascular circulation, facilitating blood flow, glucose delivery and oxygenation throughout the body, including the lower extremities and cardiac tissues. Ginkgo biloba is an ancient plant containing two important constituent groups - the ginkgo flavone glycosides and the terpene lactones. 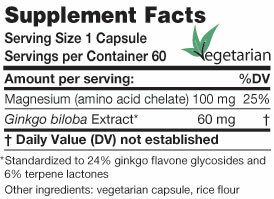 The Ginkgo biloba in GinkgoMag is standardized in relation to both ginkgo flavone glycosides (24%) and terpene lactones (6%). Ginkgo components facilitate optimal blood flow to all tissues by inhibiting platelet activating factor (PAF) activity and modulating the effects of neurotransmitters and endothelial-derived blood vessel relaxing factors (Thromb Res 2002;108:151-60; Fitoterapia 1998;49:195-244). Ginkgo promotes normal circulation (Fortschr Med 1993;111(10):170-2) and can increase comfortable walking ability in people with poor circulation (Am J Med 2000;108:276-81). Magnesium is required for ion transport across cell membranes to maintain neuromuscular electrical potentials and facilitate neuro-transmission (Clin Calcium 2005;15: 87-90, 255-60). Magnesium is important for normal vascular function and supports healthy blood pressure (Hypertension 1998;32:260-5) and optimal circulation (Circulation2000;102: 2353-2358; Vasa 1985;14:285-8). Improved breathing comfort has been achieved with either supplemental ginkgo biloba (Chinese J Integrative & Western Med 1997;3:264-7) or magnesium (Magnesium Bulletin 1997;19:4-6; Eur Respir J 1997;10: 2225-9). Suggested use for adults: 1-2 capsules twice daily, or as directed.